Wednesday, January 16, 2019 4:00-8:00 p.m.
Thursday, January 17, 2019 8:30-9:45 a.m.
JoAnn M. Husmann, nee Deiters, age 83, of Breese, died Monday, January 14, 2019 at Aviston Countryside Manor. She was born February 3, 1935 in St. Louis, MO, a daughter of the late Henry and Adeline, nee Hilmes, Deiters. In addition to her parents, she was preceded in death by her husband Vincent Husmann, whom she married September 12, 1953 at St. Dominic Catholic Church in Breese and he died September 16, 2000; siblings, Henry Deiters and wife Catherine, Mickey Deiters, Frances Banks and husband William, Virginia Edwards and husband Walter, and Catherine Deiters (infancy); father-in-law and mother-in-law, Joseph and Elizabeth, nee Moss, Husmann; and brothers-in-law and sisters-in-law, Leo Husmann, Joe and Shirley Husmann, Alvina Husmann, Regina Husmann, Florence Husmann, and Alvin “Bud” and Deny Husmann. Surviving are her children, Diane Husmann of Collinsville, Cathy Werner of St. Louis, Pam Husmann of Breese, and Susan (Mark) Beins of St. Louis; grandchildren, Dr. Jennifer (Dr. Wade McCullough) Werner-McCullough, Michael (friend Amanda Szakacsi) Husmann, Michel (friend Rob Fienup) Eichorn, and Matthew (friend Ildikó Kovács) Eichorn; great-grandchildren, Molly, Maeve, Mallory and Wes McCullough, and Aiden and Tessa Fienup; siblings, Henrietta Kliethermes of St. Louis and Georgina Elias of Carlyle; and sister-in-law, Lucille Husmann of St. Louis. JoAnn formerly worked as a cook at Mater Dei Catholic High School and Dairy King in Breese. 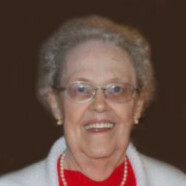 She was a member of St. Dominic Catholic Church and Altar Sodality in Breese. She enjoyed reading, jigsaw puzzles, sudoku and word searches, going to the Trenton Senior Center, but most of all spending time with her family, especially her grandchildren and great-grandchildren. Funeral Mass of Christian Burial will be Thursday, January 17, 2019 at 10:00 a.m. at St. Dominic Catholic Church Breese with Fr. Patrick Peter and Deacon Linus Klostermann presiding. Interment will follow in St. Dominic/St. Augustine Cemetery, Breese. Visitation will be Wednesday, January 16, 2019 from 4:00-8:00 p.m. and again Thursday, January 17, 2019 from 8:30-9:45 a.m. at Moss Funeral Home in Breese. Memorials may be made to Mater Dei Catholic High School or All Saints Academy and will be received at the funeral home.